A slightly dressier vegetable dish, pan roasted Brussels sprouts with bacon are wonderful for either a simple meal that needs punch, or a holiday table. 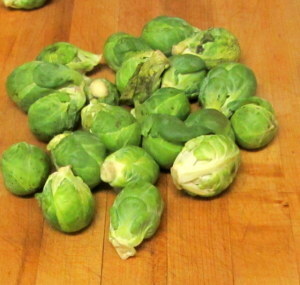 A few weeks ago our CSA farm teased us with pictures of Brussels sprouts just… sprouting… but now, we finally have them! We love these vegetables. They are, for us, a Fall treat – coming in just as the summer vegetables are over. Last year, we got them on the stalk, and I wrote about them, and how to simply steam them, which is what I usually do. I’ve learned to pan roast them, though – and I like that as a different treatment. I can do it plain, with just a little oil in the pan, but I can also use this method to dress them up a bit… nice with an otherwise simple meal. The other day I was cooking a fairly simple simmered pork chop, with rice on the side, and decided to pan roast the Brussels sprouts with bacon. 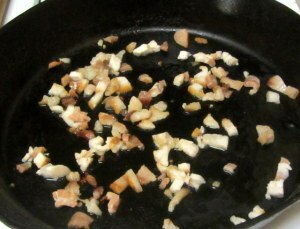 We don’t really eat a lot of bacon by itself, but I like occasionally using some to add flavor to another dish. We can buy a package of “bacon ends” at a nearby store, and I transfer them to a zip freezer bag, freeze them, and then just cut some off when I want it. If you haven’t done that, but have a more typical package, I used about the amount of 2 slices… and chopped them in small pieces. The frozen bacon is easy to chop, but if I was using a slice, I’d cut it with kitchen scissors – that’s easier to manage. I put all the chopped bits in a heavy pan over a very low heat – at this stage I basically want to render out all the fat, which I will use. I cooked it for at least 10 minutes over low heat – at this point I did not want to brown the meat at all. A higher heat is less likely to melt all the fat. 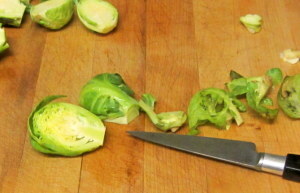 While that cooked out, I trimmed the Brussels sprouts. This time I just got them loose, not on the stem. Because they’d been cut for a while, I needed to trim the cut ends a little, as they dry up. Then I sliced them in half lengthwise – I wanted a nice flat surface to brown. After a few minutes of that, I lowered the heat, covered the pan, and let the sprouts continue to cook, steaming in their own moisture. How long you cook it at this stage depends on how cooked you like them – I was distracted, so these cooked nearly 10 minutes, and we probably would have preferred 5… They were still very good, though – not at all like overcooked simmered sprouts, which I dislike intensely… Take the lid off the pan when they are done to your taste, to let the steam escape. Edited to add – I have discovered that they freeze beautifully! 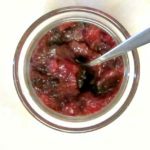 I make up a big batch before Thanksgiving, freeze them, and can just microwave them on the day – or on any other day I want a lovely vegetable dish! Wash and trim the Brussels Sprouts. Slice them in half lengthwise. Chop the bacon. Place it in a heavy pan over low heat, and render out the fat - about 10 minutes. Keep an eye on it to be sure you don't over brown the meat at this point. Turn the heat up high, until the pan is hot. 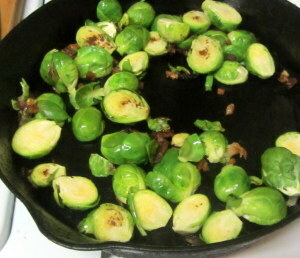 Place the sprouts in the pan - mostly cut side down, and let sit 3-4 minutes to sear. Then stir periodically, to let all sides brown, for another 5 minutes. 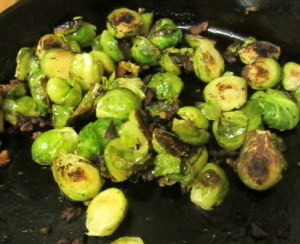 Cover the pan, lower the heat, and let the sprouts steam in their own moisture for 5-10 minutes, until cooked to taste. 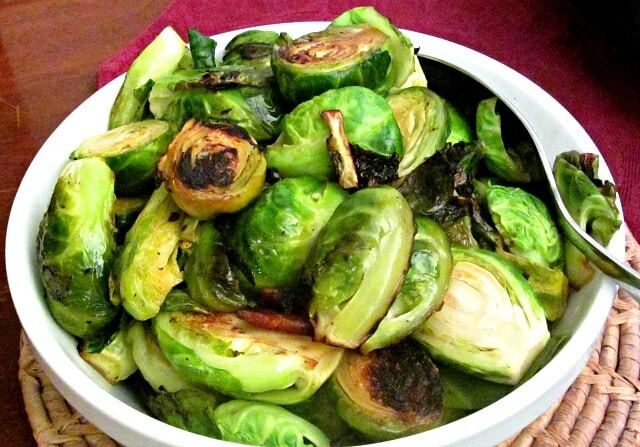 I am obsessed with pan roasted brussels sprouts! these look so crispy and toasty! love it! 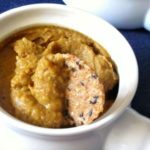 I usually roast mine in the oven, but I'm going to try them this way, sounds delicious!